We pride ourselves on our record of providing top quality products and the highest standards of customer care over our three decades plus history of serving the Mornington Peninsula. Every customer is treated with the utmost care and respect, from the free initial exploration of needs and estimate to installation, and then through our industry leading service and guarantee packages. We are dedicated to providing the very best service and the highest quality products to your budget and requirements – part of our guarantee to you. This summer from 3rd October to 30th November 2018, simply purchase a Fujitsu Ducted Air Conditioner on Fujitsu Cool Finance and pay No Deposit and 0% Interest* for up to 5 years. This means you can choose 24,36 or 60 months Interest Free finance. 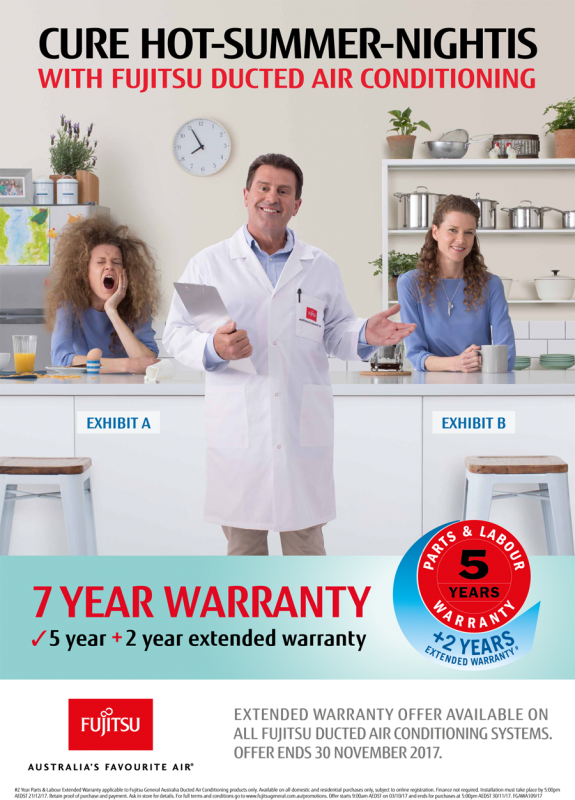 Plus, get a BONUS 2 Year Extended Warranty# on top of the standard 5 Year Parts & Labour Warranty.